The Nutty Squirrel has done it again. Click here to play! During one of his nutty experiments, he accidentally collected famous squirrels through time. He needs your help getting them back where they belong. Help the Nutty Squirrel in his task and you will receive a hefty prize! Stick close to the Nutty Squirrel in this game, as he will be telling you what you need to do. He only appears on selected reels, but he will substitute for most other symbols to help you create more wins. First, grab as many Igor squirrels on the reels because this hunchbacked rodent will get you up to 5000 times your line bet if you spin two to five of him across an active pay line. Next up is Juliette squirrel. This love sick lady will bring in up to 1500 times your line bet. There's also Thor squirrel and Lancelot squirrel. Both will get you up to 500 times your line bet. There are plenty of other symbols to help you in your quest, including acorns, leaves, honey, sugar, juice, and milk. Keep your eyes peeled for the golden acorn while you're collecting these legendary squirrels. 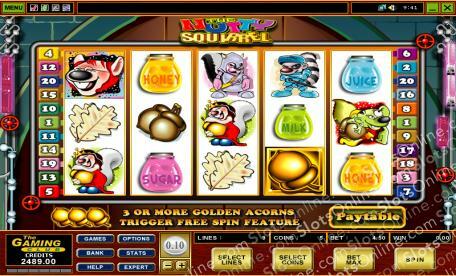 This little squirrel treat acts as a scatter and, in addition to multiplying your total bet, it will trigger a number of free spins. Can you help the Nutty Squirrel set things right? Spin the reels to find out and you might just walk away with plenty of cash. The golden acorn is a scatter. If you spin two to five anywhere on the board you will multiply your total bet by 2, 5, 20, or 100. If you spin three or more, you will trigger 15 free spins in which prizes are doubled. The Nutty Squirrel is a wild symbol. He only appears on reels one and five, but he will substitute for all other symbol (excluding scatters) to help you bring in more wins.